National Staffing Employee Week provides the opportunity to honor the contributions our consultants make toward the economy and workforce. We are indebted to them for the dedication and effort they put forth daily.Established by the American Staffing Association, this commemorative week honors the millions of temporary and contract employees working for the US staffing agencies each week. The Autumn Group, a leading IT staffing provider, is joining staffing agencies from across the nation in celebrating National Staffing Employee Week, Sept. 24-30. The Autumn Group is celebrating this week by honoring its most dedicated consultant, Manodny Salunke, who has put forth an exemplary performance for our client. 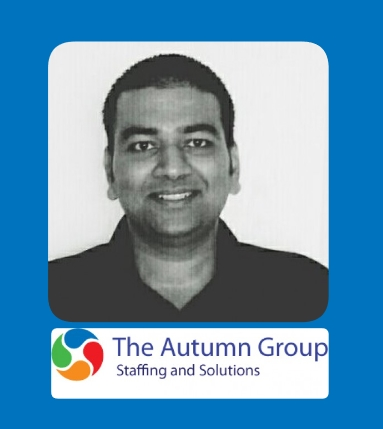 The Autumn Group would like to congratulate Manodny for representing The Autumn Group during 2018 National Staffing Employee Week! Describe your current job? – Windows System Administrator by the title but a lot more involved due to GxP process. What is your career goal? – Settle into a position and grow within the organization. What do you value most in a job? – The people I work with. What are your go-to websites for daily news? – I check the Apple News app which has all the news media in one place. What project have you’ve worked on was your favorite? – Definitely has to be my current one due to the GxP process and the challenges it brings along. Are you on social media? What is your profile? – I am but not active on social media. In the past five years, what is the most important thing you have learned? – It is always best to ask questions first than beg of mercy later.